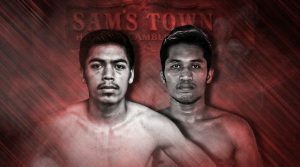 Sam’s Hotel and Gambling Hall will host a ShoBox event on Friday night. This card will feature eight bouts and will be promoted by Mayweather Promotions. The main event will feature featherweight Angelo “El Chinito” Leo of Las Vegas, Nevada facing off against Neil “The Best” John Tabanao of Cebu, Philippines. This will be Leo’s first scheduled ten rounder after winning sixteen straight. Tabanao has won his last four bouts and will be making his US debut. Leo, 16-0 (8), started his career at bantamweight and eventually moved up to featherweight. Tabanao, 17-4 (11), started out at super bantamweight and has even gone up to super lightweight two fights ago. The co-feature will have Xavier Martinez, 13-0 (9), of Sacramento, CA, who has stopped his last five opponent’s. He will be taking on John “Mulawin” Vincent Moralde, 21-2 (11), of General Santos City, PH. Last year he defeated Ismail “Sharp Shooter” Muwendo, 19-0. This bout is scheduled for 10 rounds. Another bout on the card will feature ten round welterweight showdown between Cameron “Suave” Krael, 15-13-3 (4), of Las Vegas, and Angel “Hit Man” Hernandez, 15-12-2 (9), of McAllen, TX. There will also be three eight rounder’s on the card with Super Featherweight Andres Cortes, 10-0 (6), of Las Vegas, will be taking on Jamal Dyer, 9-1 (5), of Baltimore, MD. Welterweight Sanjarbek Rakhmanov, 11-1-1 (5), of UZB, out of Las Vegas, will be taking on Keith “The Bount” Hunter, 9-0 (7), of Las Vegas. Super Middleweight Kevin “The Second Coming” Newman II, 8-1-1 (4), of Las Vegas, will be taking on Cesar “Principe” Lopez Ugarte, 8-3 (6), of Augascalientes, MEX. In a pair of six rounder’s Lightweight Kingdamon “Don’t Blink” Antoine, 8-0 (7), of Akron, OH, will be taking on Raheem Abdullah, 3-1 (0), of Colorado Springs, CO. With Super Lightweight Maurice “Ambitious” Lee, 9-1-2 (5), of Woodland Hills, CA, with a to be announced opponent.